I am currently working on a little crêpe project and I have been experimenting all kinds of batters and fillings…and this one has been one of my favorites. It’s so simple but a real delight. Now I was wondering what the difference between dulce de leche and caramel was. Dulce de leche has this exotic sound to it, and is found in many South American households and is mainly condensed milk cooked and reduced to a brownish paste. In France, we call caramel two things, one thing being the sugar and water melted and reduced to a and golden brown color, the other thing being the mixture of sugar, butter and cream that has turned into a thick smooth and velvety texture. Dulche de leche is translated into French by “confiture de lait” or milk jam and it’s made by boiling whole milk and sugar for about 3 hours. The milk reduces and turns thick and golden brown. you can spray it on crêpes, on buns, brioche, etc…like you would use jam, or just lose your finger in the jar and enjoy it. As you can imagine there are as many crêpes recipes as there are people, less flour, more milk, less eggs, more water, cider, no cider, beer, no beer…you have to find the batter recipe that fits your tastes. Whereas some people like crêpes to be crunchy, I like mine softer. If you want them crunchy, they need to cook at a low temperature for a longer time. If you like them soft, they need to cook rapidly at high temperature. So voila! find the crêpe recipe you like and play with it. Now I have to admit that I cheated with this one. I did not make my own dulce de leche, but I bought a jar at the store…homemade or not, I loved it, and could hardly keep my finger off the jar. I will definitely write a post about making homemade dulce de leche when I have 2 or 3 hours to spare. In a mixing bowl, mix eggs and sugar and beat until a smooth a white consistency. Add flour, mix well. Add milk and stir until the batter becomes smooth and homogeneous. Melt butter until it becomes brown and add to the batter. Add vanilla extract and rum. Mix well and let it rest for about one hour. Grill apples on a skillet or grill pan. 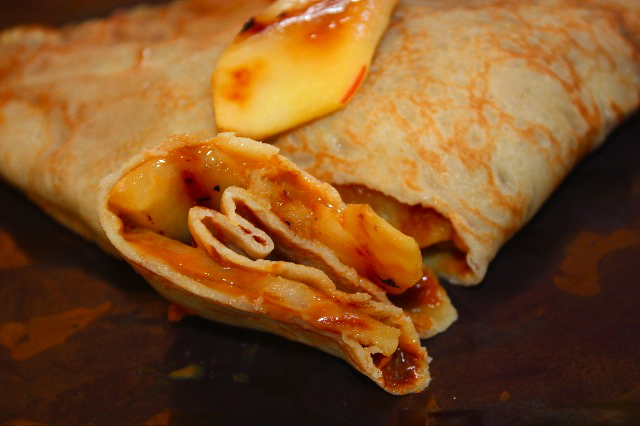 When the crepes are done, spread one tbs dulce de leche on each crêpe and garnish with apples. Fold and enjoy. This entry was posted by silvia on November 16, 2010 at 12:01 am, and is filed under Sauces and condiments. Follow any responses to this post through RSS 2.0.You can leave a response or trackback from your own site. yum, these look delicious! i like it when you make desserts. i know they have to be scrumptious! Thanks for your research and development. This looks fabulous and mouth watering. delicious! dulce de leche would be perfect with apples. Every Saturday morning would find me at our local farmers market havihng a savoury buckwheat crepe. I look forward to your crepe experiments Margot. This would be the ultimate treat, any time of day! And since I just had dinner, I’m actually thinking dessert. I love the addition of the rum in the batter! These crepes sound wonderful! Wish I had some for dessert! Silvia, I would do the same thing! By the end of the day, the DDL will left nothing. haha…. And I bet the crisp taste real good! Hope you’re having a great day. I have never considered combining dulce de leche with apple’s before. That now seems completely ridiculous looking at your crepes. They are clearly a match made in heaven and one that I will have to enjoy soon! 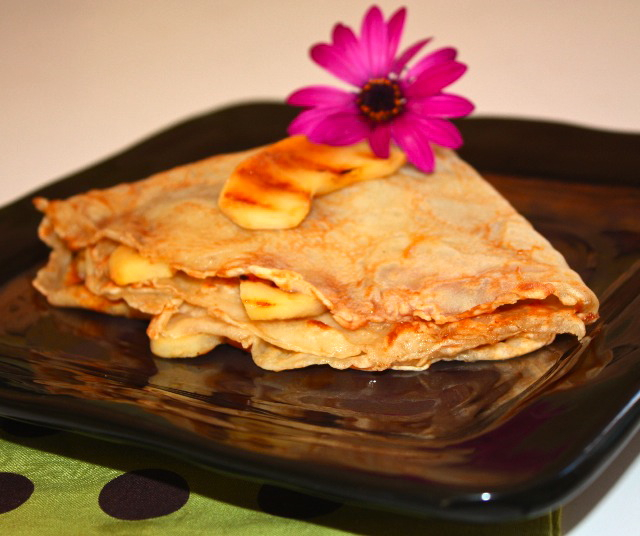 I adore crepes…they make such a wonderful base for dinner AND dessert. 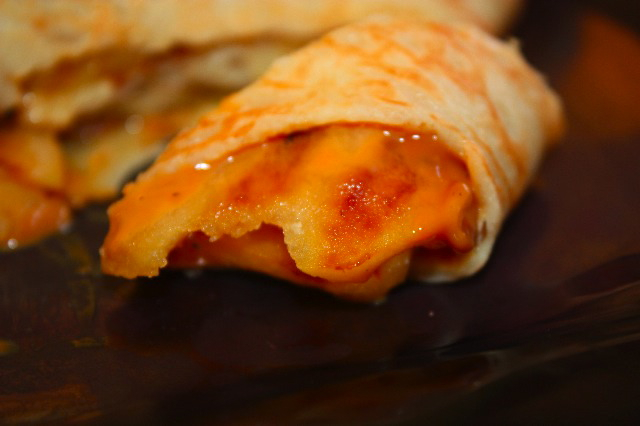 These apple crepes with that lovely sauce sound DIVINE. Thank you for sharing. I hope the rest of your week is beautiful! 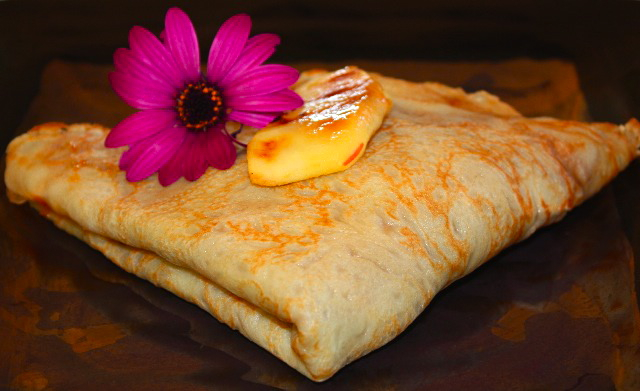 I am just in awe looking at those beautiful crepes….wow…..what a culinary masterpiece!! If they were not beautiful enough, you had to fill them with apples and dulce de leche…..just perfect!!! Hey friend! Good to hear from you. What a gorgeous treat this is! You couldn’t put together anything more enticing! Simply beautiful! We love our crepes around here but we’ve not tried them like this. Usually with berries or cinamon applesauce. Living close to Mexico, we have been lucky to enjoy Dulce de Leche in many things.